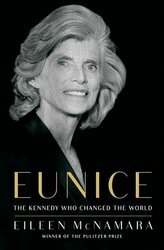 Defying the expectations set for her, Eunice Kennedy Shriver worked tirelessly for the causes she believed in, even as the spotlight stayed firmly fixed on her well-groomed brothers. Over the decades, she became an advocate for disability legislation, and an instrumental founder of the National Institute of Child Health and Human Development and the Special Olympics. Author, educator, and former journalist Eileen McNamara will speak on Shriver's grit and determination, outlining her enduring legacy on par with those of her more celebrated siblings. Refreshments will be served. Free and open to the public! Please be aware that there is construction happening at Brookhaven. Parking may be found in the circle in front of the main entrance, or the first lot on the right marked "staff". Please try not to park in a resident's spot.